The fall season is all around us here in Zeeland, Michigan at Garden Crossings. The leaves are just starting to change color, the landscapes are looking tired, but there are still a few signs of summer all around us. 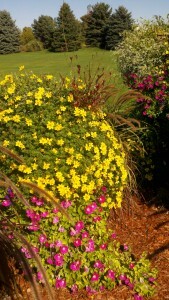 There are a couple annuals that still have outstanding color despite being hit by several early frosts. One in particular that really stood out to me this weekend (10/1) was ﻿﻿Goldilocks Rocks™ Bidens. 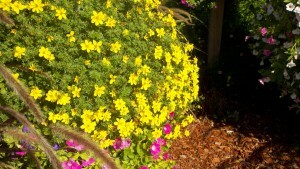 The deep yellow flowers still looked just as nice as they did when they were first planted. And the mass of blooms has been a constant all season long also. Even the foliage is still green and lush. I will be perfectly honest here, these have not seen much fertilizer either for the past month or more. I have been really impressed by the performance of Goldilocks Rocks™, one thing in my mind that really makes a great annual is when it last well past the season it is intended for. And here in Michigan, if you can keep your annuals looking good until Labor Day you should get a gold star for your efforts. Now I will follow that comment up with if you put the effort into your plants your will get the outcome that all home owners with plants desire. My top 3 tips for annual longevity… Fertilizer!!! every 10-14 days, water consistently, and give them a good hard ‘haircut’ when needed!